A couple of days before the New Year we went on our last in 2011 trip to Sonoma. Unlike our November trip, this time everything was as expected: naked or covered with brittle brown leaves vines, ripen persimmons on bare branches and grey sky. 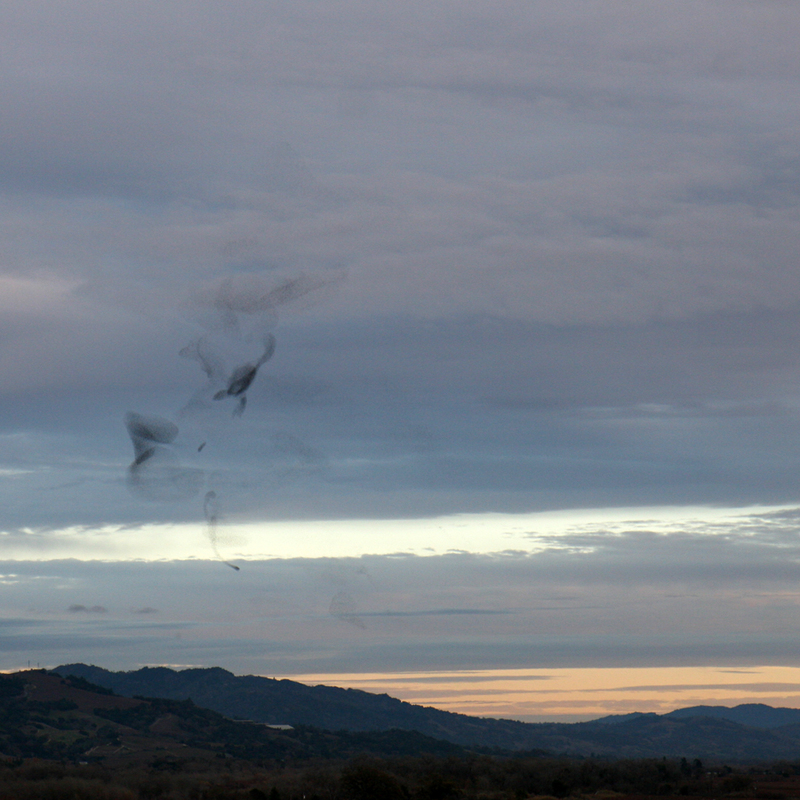 And “sparrows are flying again.” Well, I’m not sure what kind of birds those were (dark smudges on the picture below aren’t image artifact or dirty lens – those are flocks of birds flying together) but it was a mesmerizing spectacle. Usually we see those synchronized swooping and turning of birds en masse from a moving car window but this time we were on solid ground and were able to take a lot of pictures. The key is located in the home on the small table to the left of the door as you enter. Yes, we do keep the doors unlocked sometimes up here. “On the small table…” Yes, that was where we found it once we arrived. We went through the house to figure out what was where and all of us got a strange feeling: it looked inhabited, as if owners had just stepped away to get something to eat and could be back any minute. No, there was no warm kettle on a stove or smoking cigarette in an ashtray, but there were bottles with wine on the kitchen counter, cheese in the fridge and a motorcycle in the garage. I even went outside to check again the house number. We were in the right house – a nice one, I should add, with spectacular views from windows, two fireplaces (one of them in a bedroom that I’d won in a coin toss) and a well stocked kitchen. A nice but a little strange house. And when my vSO noticed a white child’s dress in a plastic cover hanging in the empty closet we agreed it felt like we were in one of Stephen King’s novels. 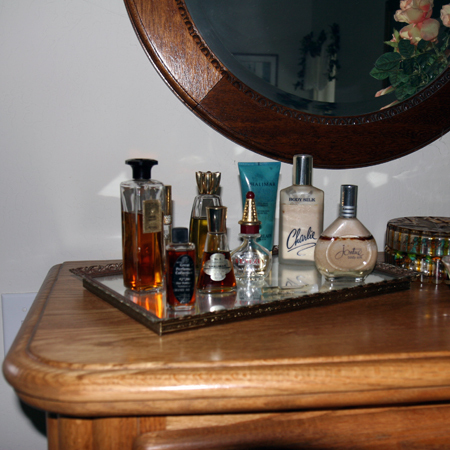 The feeling has even increased when I discovered a tray with perfumes on a dresser in my bedroom and a display stand with perfume miniatures in one of the bathrooms. I thought that the house was tempting me. Nothing sinister had happened during our stay (if not to count that I got spooked in the morning when I opened blinds in our bedroom and saw an owl sitting on a balcony railing – a wooden one as I realized a second later). It was a very pleasant trip. We visited many great wineries (new find for us – deLorimier Winery), tried and bought some good wines (they’ve passed paw inspection by Rusty on our return) and I wore wonderful perfumes (Serge Lutens’ Jeux de Peau that I deemed wine-testing-friendly and brought with me for that purpose and Dior’s Dioressence from a vintage mini bottle in the bathroom of that strange house – it was still good, I enjoyed it in the evenings). This entry was posted in "Four legs good", Acquaintance with letters, In Vino Veritas, Random Stuff and tagged deLorimier Winery, Dior, Dioressence, Jeux de Peau, Serge Lutens, Stephen King. Bookmark the permalink. I was almost sure MUFЯAP! MUFЯAP! would be about some kind of feline parfum — for attracting cats, or for being as attractive as a cat! BRAVO! You should! A good cat’s picture almost guarantees a smile from your friends/readers. Seems like a wonderful trip, full of little surprises! By the way, I’m not 100% certain, but here in the UK, the birds that congregate like that (usually at dusk) and form mesmerising patterns are Starlings. Not sure if you get Starlings in the USA. Wikipedia says that we do but I don’t think those birds were Starlings but I don’t know for sure: they are usually fly too far to see their plumage. That child’s dress would have totally spooked me out too! Sounds like a rential property made for perfumistas though and how wonderful to have vintage Dioressence to enjoy. Do you think you’ll seek out a mini elsewhere? 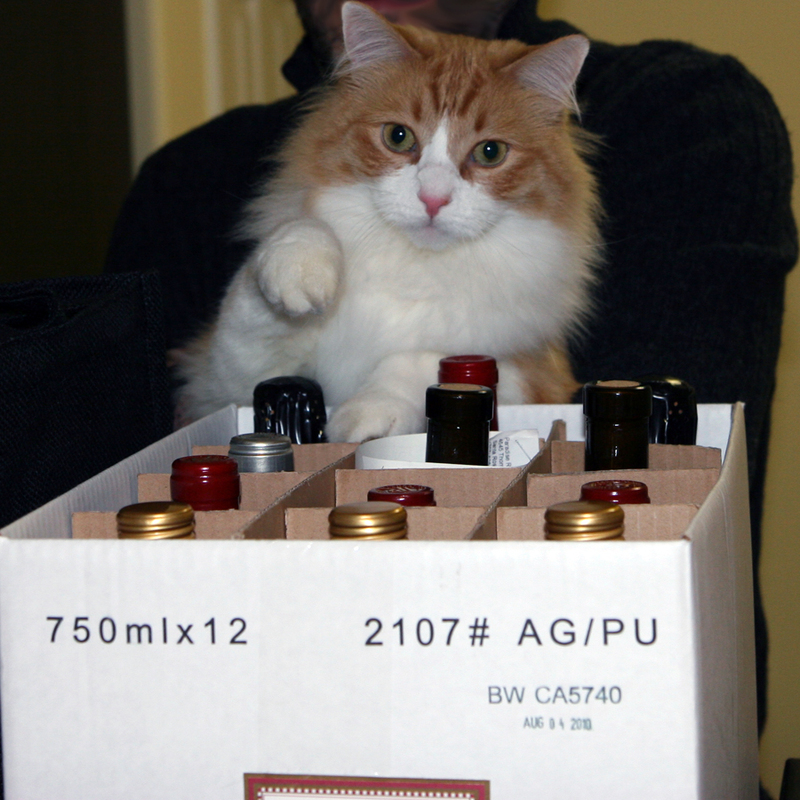 Glad the wines passed Rusty’s paw inspection! I have a decant of vintage Dioressence so I’m fine but it was a nice 10 ml mini. I have Diorissimo in such bottle so for a while I thought it would be nice to have it. Rusty always inspects everything new that we bring into the house. I hope he looks out for us and not just being nosy. Staying in a home rental is always a little weird— that’s the route we took on our honeymoon, and my family did for our wedding. Both were beautifully maintained, beautiful homes, but I could never shake the feeling that I was in someone else’s nest. I still can’t get over how similar Rusty is to my cat Magee! It’s crazy. Yep! As I mentioned in your interview post, when I saw your cat’s picture there my first thought was that it was my interview and that I sent Ari a wrong picture of Rusty. They are BOTH sooooo cute!!!! This is an amazing picture of Rusty. Undina, this post was genius — not in a way that is clever or contrived, but in the way that you truly made me a feel a spooky chill as I moved with you through that house! And you know what else made it feel very Stephen King? Not only that there was a tray of perfumes in your bedroom, but they are perfumes like Charlie and Jontue — so very late 70s and early 80s, around the time when The Shining came out. Eeek!! Well, I did a quick check on Basenotes and I guess Charlie and Jontue are actually early and mid-70s scents. But still, they are of that era when Stephen King’s work became known to me. I didn’t want to complicate the plot but there was something else about those perfumes: two of the bottles were of … Shalimar. I was surprised since bottles looked unfamiliar. And then I noticed a “fine print” – something like “Our version of Shalimar”. I didn’t know those existed. Some parallel reality. This is both hilarious and creepy. If I had known about this in advance (that scary dress!) I would have been worried about you. I’m glad you got out unscathed. ;) And the post title is the best thing to pop up in my twitter feed ever. It’s funny post-factum but at some point I did feel unease. I even insisted on sending the house address to our friends at home (which should have been done in advance anyway but I didn’t think about it this time). I loved this story, starting from the rather sinister gathering of birds – you were not far from Bodega Bay after all, and the setting for another famous horror pic, The Birds! How great to find the perfumes in situ and how trusting to leave the door open – I was wondering how you were going to get in to get the key off the small table – everybody locks their doors over here. Vanessa, I waited for you to appreciate the birds aspect! Yes, you’re absolutely right – we were just discussing that du Maurier’s story and Hitchcock’s movie when we saw those birds. But it was before we saw the house and what came later colored my associations. I agree, a door left open was unusual but it’s a house in the middle of winery so I don’t think random people would be anywhere near.